1. BY HAND: Put the egg, flour, salt, sugar, 25g butter and the yeast in a large mixing bowl. Using a wooden spoon, slowly mix in the warm milk and the warm water until the mixture forms into pliable dough. Knead on a floured board for 5 to 10 minutes until the dough is elastic and smooth, then cover and put the dough in a warm place, until it has nearly doubled in size. BREAD MACHINE: Put the milk, water, egg, flour, salt, sugar, 25g butter and the yeast into your machine and select dough, normal. This will mix, knead and prove the dough and takes about an hour and a half depending on your machine. 2. Preheat oven temperature to 200C/400F/Gas 6. Grease and/or line a large baking sheet with baking paper. 3. SHAPING DOUGH: Place the dough on a floured surface and knead well until it feels elastic. Return the dough to the bowl, cover and chill in the refrigerator for 1 hour. Return the chilled dough to your floured work surface and roll it into a rectangular shape, around 30cm X 24cm. 4. Separate the remaining butter into 3 portions and then using one third of the butter, dot the butter over the upper two thirds of the rolled dough, keeping a 1cm border around the edges. 5. Fold the dough into three, bringing up the bottom unbuttered part of the dough, and then folding the top buttered part of the dough over. Give the dough a half turn so that the open edges are now top and bottom and seal the edges with your rolling pin. Then take your rolling pin and press the dough at intervals to seal the dough and create air pockets. 6. Roll out into a rectangle again, the same size, and then continue as before, two more times until your butter is used up. After the last rolling when all the butter is used, return the dough to the refrigerator to chill for a further 30 minutes. NB: It is important to return the rolled dough to the fridge in between each rolling to ensure the butter does not melt and the dough does not become too sticky. 7. Remove the dough from fridge and roll carefully into a large rectangle, 30cm x 24cm. Mix the filling ingredients together and spread it over the dough, pressing it into the dough. Starting at the long side, tightly roll up the dough like a Swiss roll. Cut the roll into 12 equal slices, and arrange them into a tree shape on the prepared tray, starting with 1 roll, 2 rolls, 3 rolls, 4 rolls and then ending with the trunk of 2 rolls. *(NB: Optional quick method – using the ready-made puff pastry, follow this step and proceed as below). 8. Bake for 20 to 25 minutes until they have puffed up and are golden brown. Remove from the oven and allow to cool, before gently sliding the “tree” onto a large serving platter or board. Allow to cool completely before decorating. 9. 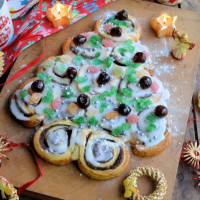 Mix the icing sugar and warm water together to make a thick paste; spread the icing over the rolls before decorating with cherries, silver balls and jellied sweets.